Fear. We all experience it. As much as we try to fake it, there are things in this world that make us squirm. For my, skydiving, bungee jumping, driving along #3 Road and parking at Yaohan would certainly fit into that category. Another fear of mine relates to eating. Predictable, I know. 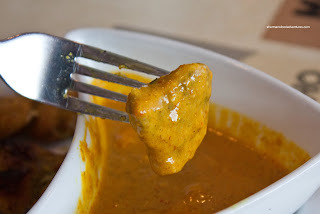 Whenever, I see fusion food, it makes me uncomfortable. However, there are times where the food surprises me and everything is good. 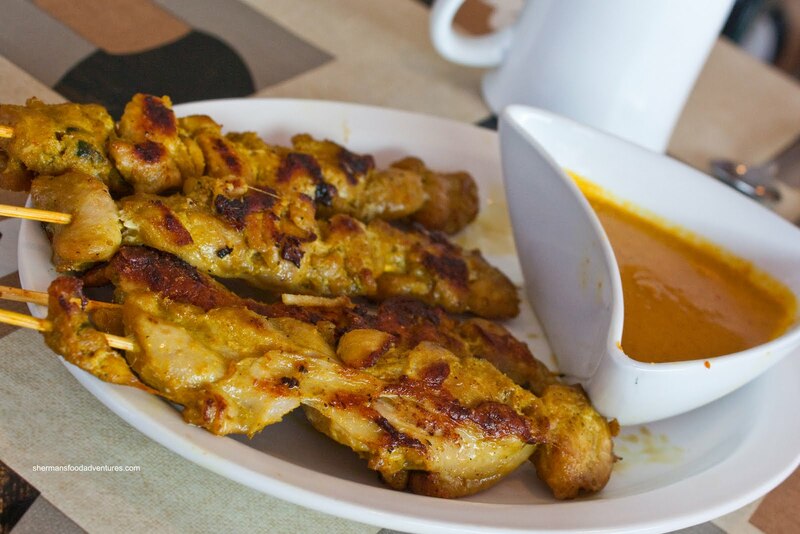 Now fusion is one thing; but how about combining completely different cuisines at one restaurant. Try Italian and Thai... ??? Yah really. 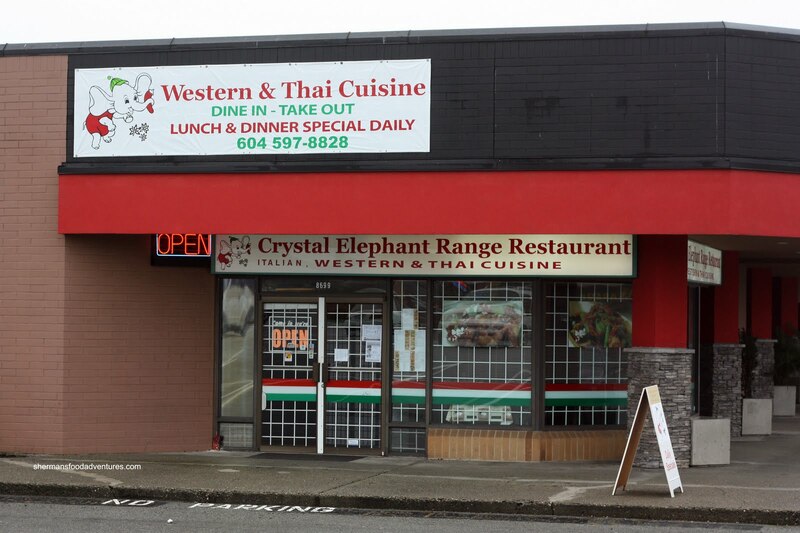 When I spotted Crystal Elephant Range and noticed the strange combination, it elicited ideas of driving away fast. Really fast. But wait. I need to give it a chance don't I? What is the worst that can happen? Fine, I needed to see for myself. 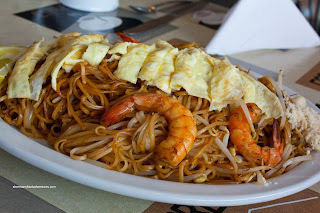 Situated in the old location of Tony's Pizza and Pasta, it is very much like the old restaurant, except they added Thai food (and some Chinese and hamburgers... ???). Okay, after looking at the menu, I got a clearer picture of the place. 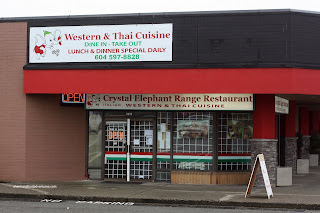 It turns out that Tony used be at the Chili Club in Vancouver, so that's where the Thai food comes into play. As for the Italian, Maria does that part. So it's like 2 restaurants in one. Okay. Since I wanted to give this place a fair shake, I had already planned in my mind to visit it at least 3 times before I wrote this post. 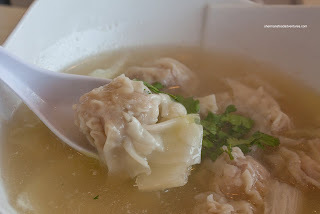 For my first visit, I decided to go for something out of left field and choose the Wonton Soup. And you know what? It was not half-bad. Consisting of pork and shrimp wontons, I ate the whole thing without much incident. The pork had a nice bounce texture and it was well-seasoned. The broth was not exactly a traditional wonton soup base. Rather it had napa cabbage in it. Once again, it was fine being more on the sweet side. 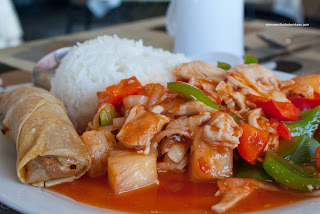 For reasons unknown, I went for their Thai lunch special which was the Sweet & Sour Chicken served with rice and a spring roll. Well, I really do not have much to say about it other than it was a sweet & sour chicken dish with tender chicken slices and fresh crisp veggies. Not something I would normally order, so I do have a bias against it. Ultimately, I was indifferent. On my second visit a couple of days later, I went for the Chicken Satay. Wow, for $5.95, this was a very huge dish. The picture doesn't do it justice because the skewers of chicken were really, really big. They used dark meat with the skin on and that resulted in an excellent product. The meat was moist and well-seasoned with curry. The accompanying coconut curry dip was fantastic. Slightly sweet with a nice kick, this had the right consistency and clung to each piece of meat perfectly. Very good satay. Of course that wouldn't be enough food right? So I got the Pad Thai as well. Now if you are looking at the picture and freaking out, I don't blame you. It certainly didn't look like any pad Thai I've ever had before. No preserved turnip, no pressed tofu and really no tamarind or enough spice. Why you might ask? Well, I have the answer straight from the chef's mouth. You see, even after my first visit, the proprietors chatted me up. Being one of the few Cantonese-speaking customers in the area, I guess I was "refreshing". So I discussed with Tony the reasons why the pad Thai came out the way it did. Once again, it was due to the clientele in the area. They don't like spice, they don't like tamarind, they don't like fish sauce etc... Hence, the pad Thai resembles more of a Pad See-Ew instead. With that in mind, it was pretty good in that respect, it just wasn't a pad Thai in the traditio nal sense. With that being said, Tony would happily make a real pad Thai if one wanted it. 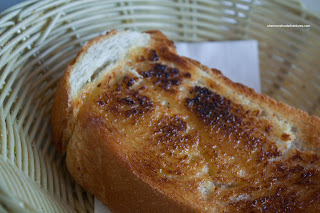 As if this wasn't enough food to write a post, I went back for a third visit with the full intention of trying out a pasta as well. Hold a moment though. I won't only eat one item. 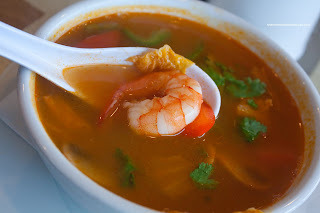 That would be a waste of a visit; thus, I started with the Tom Yum Goong. First of all, like many of the items I've tried so far, there is a twist of sorts. The usual items were there - fish sauce, galangal, lime, cilantro, lemongrass, shrimp and mushrooms. That made for a flavourful, if not a tad salty broth. However, the overall flavour profile was altered with the addition of green and red peppers (and some napa cabbage...). I wouldn't say it was a bad per se; but it was not very traditional tasting as a result. 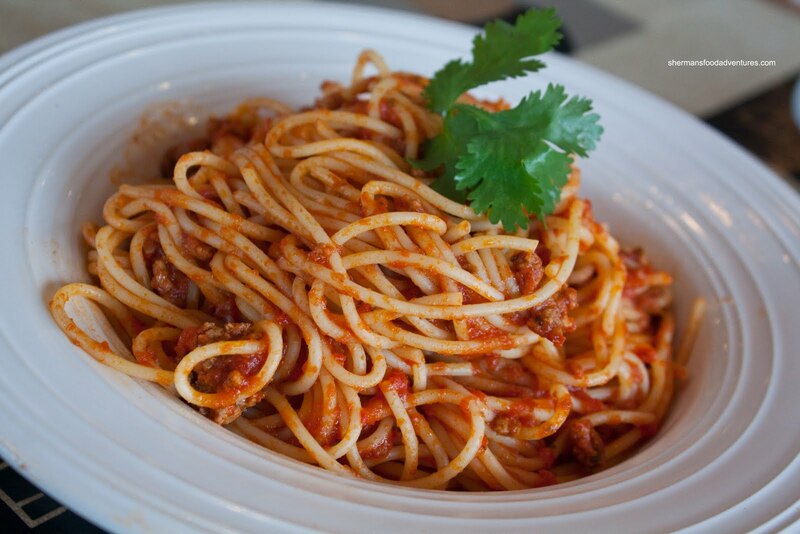 As for my pasta, I got the Spaghetti with meat sauce. Nothing fancy nor modern; but it was solid. The pasta was al dente and there was just enough sauce to coat the noodles. It was slightly tart with a touch of sweetness. It could've used a bit more salt; but with the addition of Parmesan, it alleviated that issue. So what has 3 visits taught me about this "fusion" restaurant? Well, the people are very nice and so are the prices. I honestly can't say it is necessarily authentic; but then again, what are the demographics out here anyways? Hence, they don't really need to be authentic since the clientele may not go for it. On the other hand, you could ask them to make it more "authentic" if you prefer. However, if you do not have lofty expectations, it does the job.